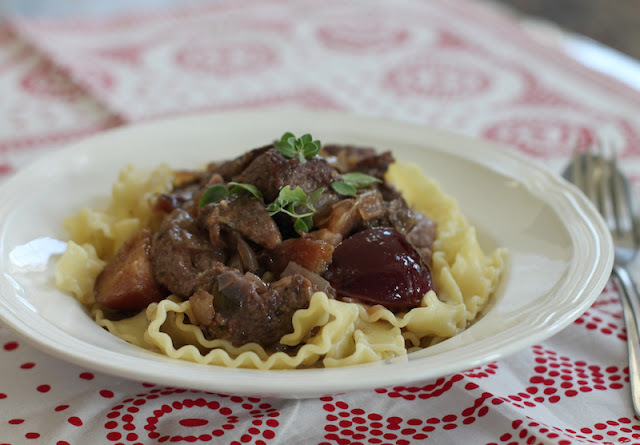 Lean but flavorful, venison benefits from long, slow cooking. 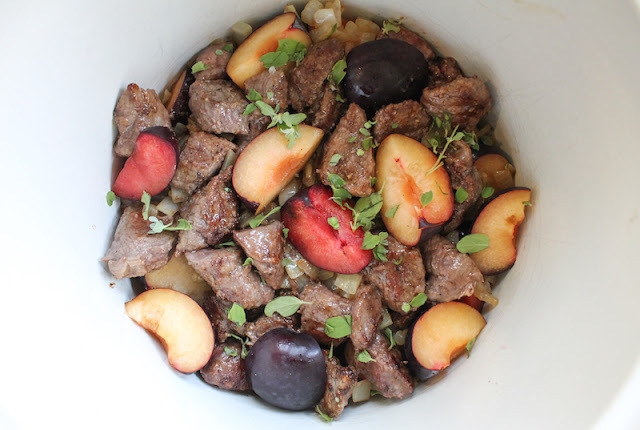 The hint of sweetness from the lovely plums pairs beautifully with the lean meat, creating a rich gravy that can be served over rice, potatoes or pasta for an even heartier meal. It's almost deer hunting season where I come from so I know a lot of folks will have their freezers well stocked before too long. 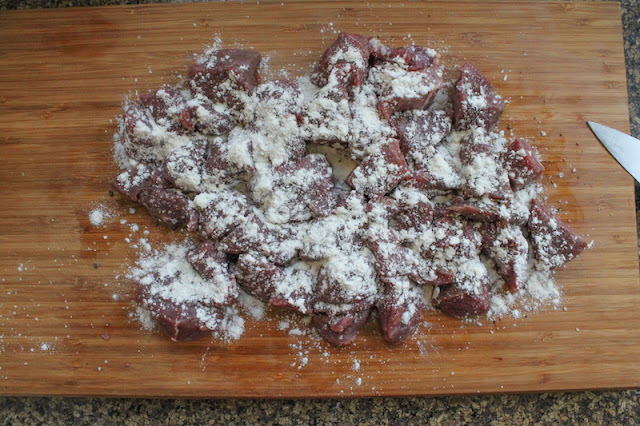 In Dubai, if I want to cook venison, it comes from farms in Australia where the deer roam freely and are completely pasture fed and free from antibiotics or growth hormones. Many years ago, on a holiday in Tasmania, I booked my family to stay overnight on a deer farm. As we drove up the long and winding dirt road to the farmhouse, the deer ran away swiftly as a herd, reminding me more of a school of fish underwater, so fluid, graceful and in sync were their movements. We never did get photos of the skittish deer (understandably!) but dinner that night in our tiny house was a spontaneous meal of foraged wild mushrooms and venison fillets I bought from the farmer, then simply pan-fried. He gave me a quick tour of the spotless abattoir and the area where they hung the meat to age as well. The place is called Deerfield Farm and I'm pleased to say it's still in business, although under new management. 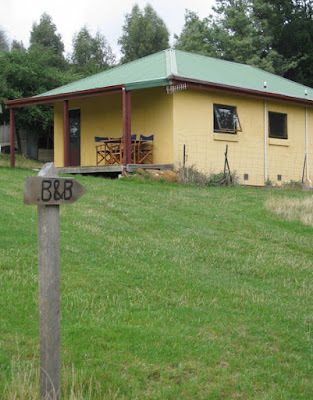 The little B&B sign cracked me up. Our tiny house was it! 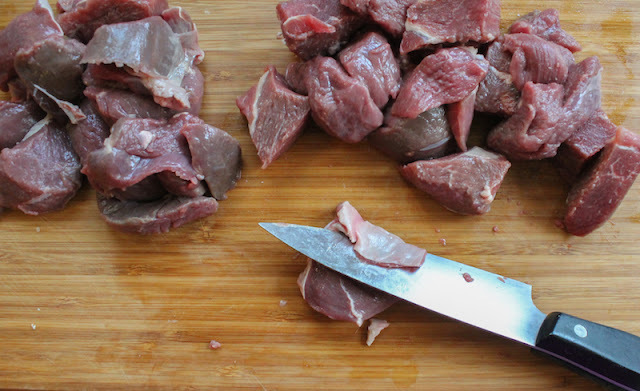 It’s such a lean meat that venison is best cooked either quickly like in a stir fry and served medium rare or braised, that is to say, fried lightly and then cooked long and slow in a closed container. 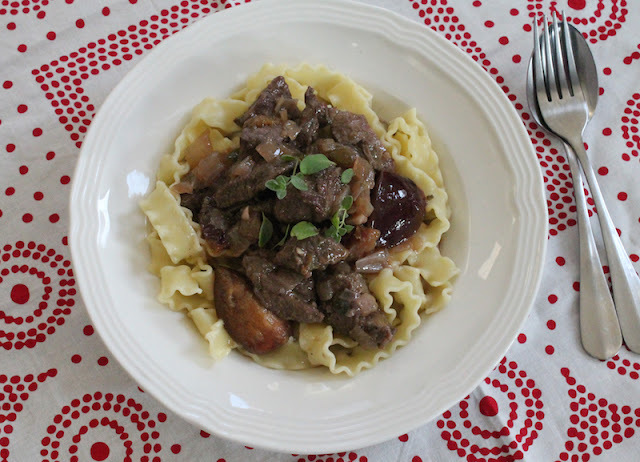 Since our Sunday Supper theme this week is Warming Trends, we are sharing recipes that will warm you up, from stews and soups to hot beverages and desserts, so you know I had to go the braised route. I served this delicious warming dish over pasta but it would work as well with mashed root vegetables or rice or even atop soft polenta. Trim your meat of any silverside and gristle and cut it into bite-sized pieces. Season the meat with a good sprinkle of salt and black pepper. Now sprinkle on your flour and then toss the pieces around gently to coat. Chop your onion and garlic. 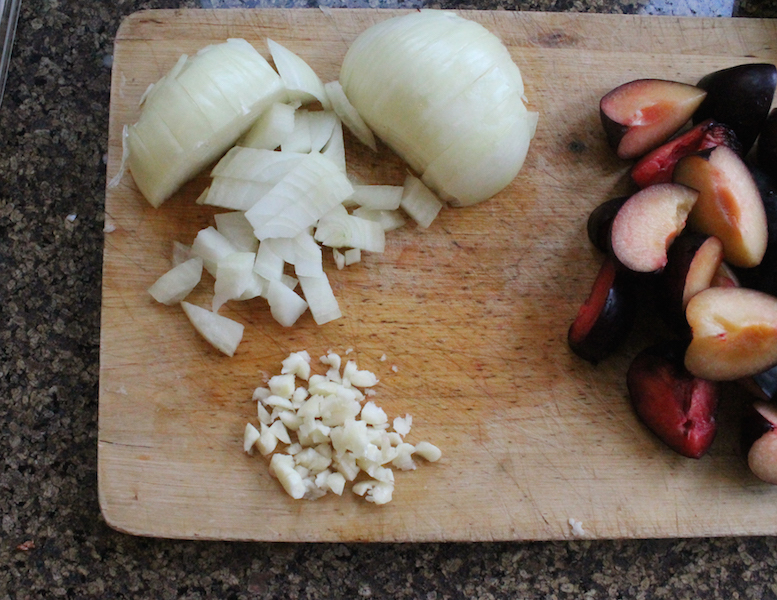 Quarter the plums and remove the stones. 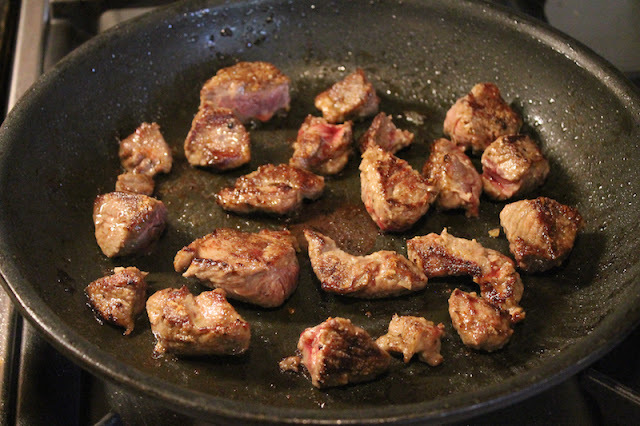 In a skillet over a medium to high heat, brown the meat in batches in a little bacon fat or olive oil. Be careful not to overcrowd the pan. Remove each batch as it browns and continue until all the pieces are done. 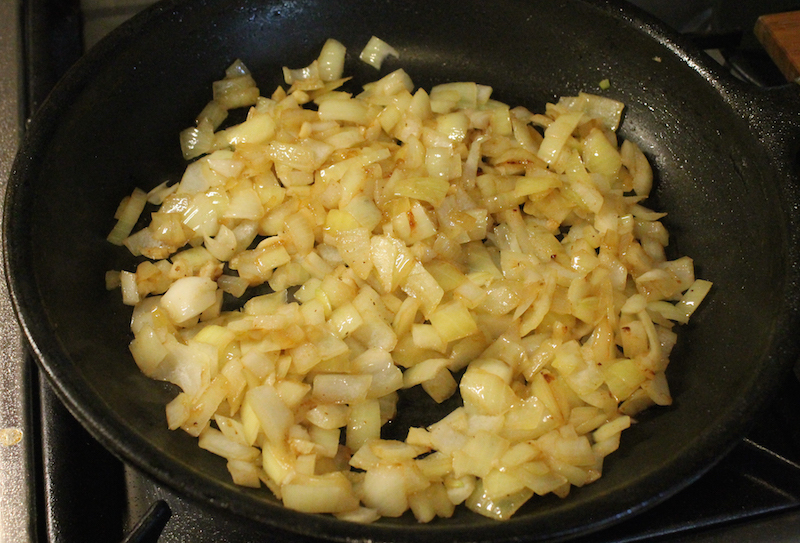 Add the chopped onions and garlic to pan and sauté until lightly colored and all the sticky stuff on the pan has loosened. 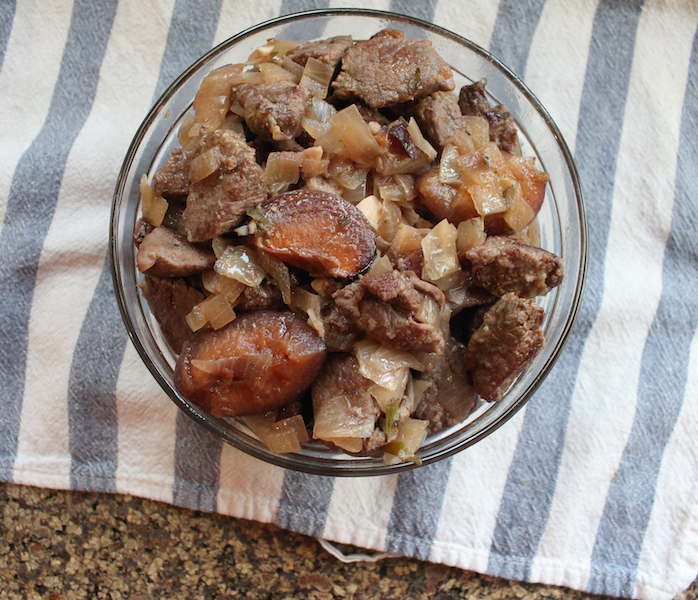 Add half of the sautéed onion and garlic mixture to the bottom of your slow cooker. Then add half of the browned meat along with any juices that have collected in the bowl. Follow those with half of the quartered plums. Sprinkle on half of your fresh thyme. Repeat with the other half of everything. 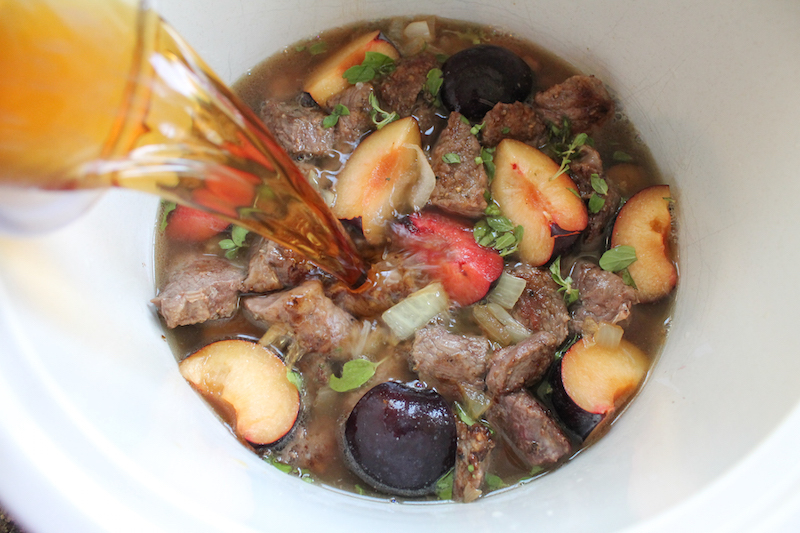 Add in the vermouth and the stock. Cook on low for about six hours without removing the lid. Go get cozy in front of a fireplace if you’ve got one, pour yourself a cup of tea or cocoa and read a good book until the whole house starts smelling wonderful. 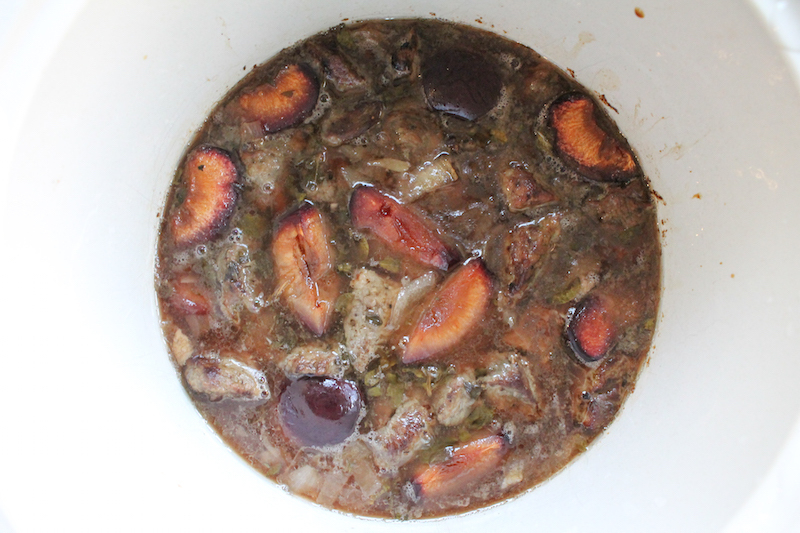 Remove meat and plums with slotted spoon, leaving behind the liquid. Mix the cornstarch with a little cool water to make a paste. 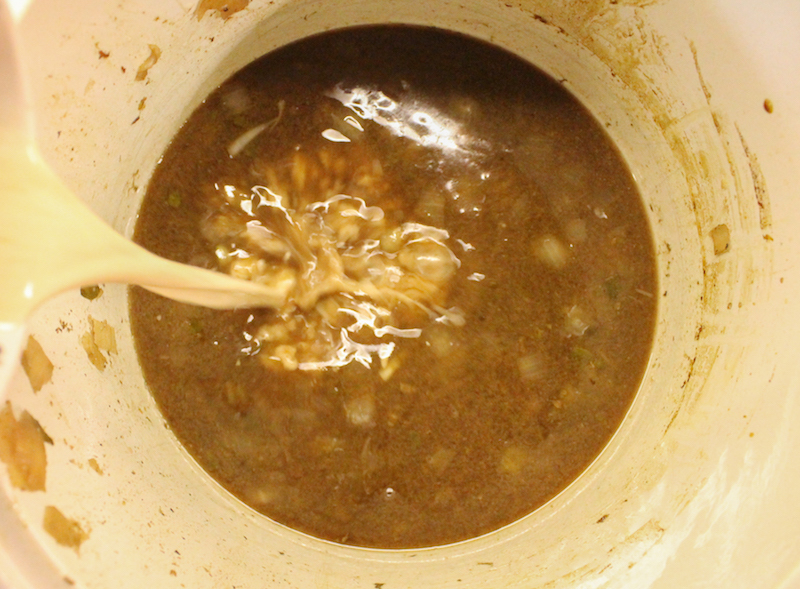 Add a little of the hot slow cooker liquid into the cornstarch slurry. 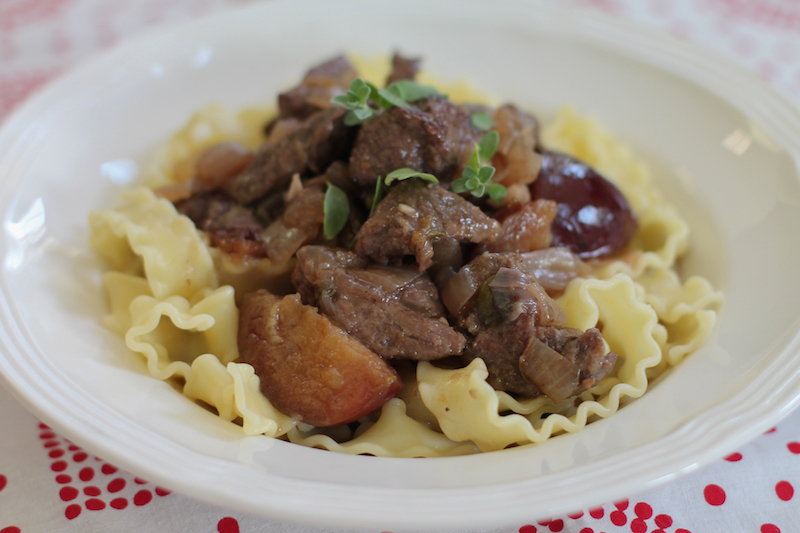 Add it all back into the slow cooker. Put the lid back on and turn the slow cooker up to high for about 30 minutes, stirring periodically till the sauce thickens. 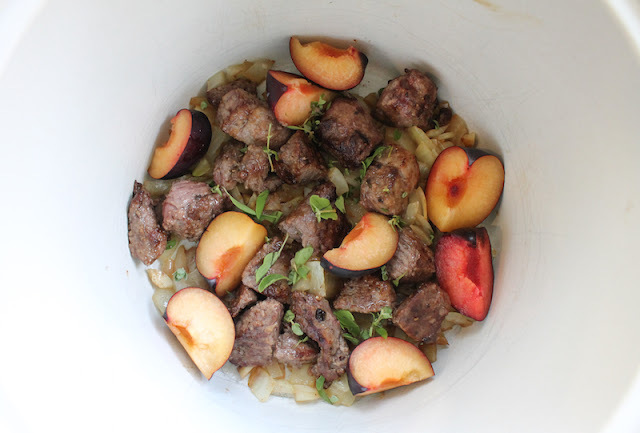 Return the venison and plums to the pot and warm through. Taste for salt and pepper and add more if necessary. Serve over wide egg noodles and garnish with some more fresh thyme. Many thanks to today’s Sunday Supper host, T.R. of Gluten Free Crumbley. It's not actually cold yet where I live but I LOVE this theme. Enjoying warming foods is yet another reason why God created air conditioning. Join the #SundaySupper conversation on Twitter on Sunday! We tweet throughout the day and share recipes from all over the world. Our weekly chat starts at 7 pm ET. Follow the #SundaySupper hashtag and remember to include it in your tweets to join in the chat.